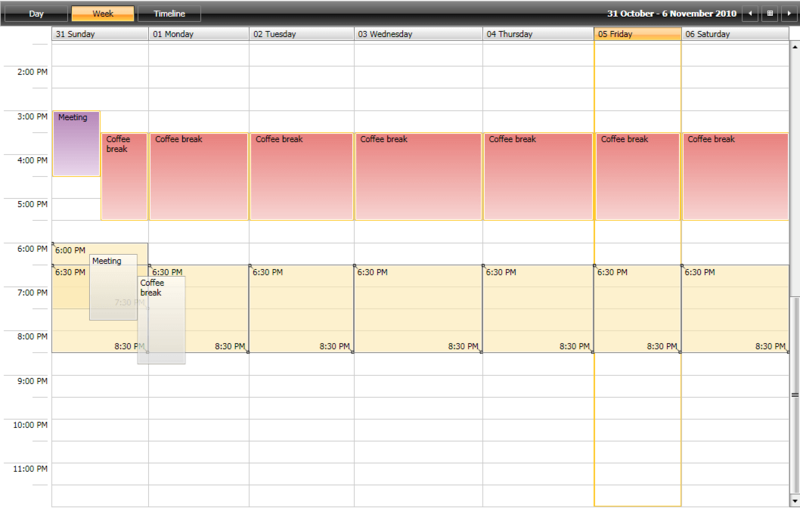 RadScheduleView uses DragDropManager to implement drag and drop of appointments. In order to add some custom logic for drag and drop, you can inherit the Telerik.Windows.Controls.ScheduleViewDragDropBehavior class. The class provides several methods that you can override to implement custom drag and drop functionality. This article will demonstrate all of the available methods. Appointment - Holds a reference to the appointment that is held with the mouse. DestinationAppointmentsSource - Holds a reference to the AppointmentsSource collection of the drag destination. DestinationSlots - Gets a collection containing the new slots of the dragged Appointments. DraggedAppointments - Contains all appointments that are being dragged, including the appointment that is selected while the user clicks and holds the mouse button. When resizing this property is null. IsControlPressed - Gets or sets a value indicating the control key is pressed. ServiceProvider - Gets the IServiceProvider associated with the current instance. SlotDuration - Gets the duration between two minor ticks. SourceAppointmentsSource - Holds a reference to the AppointmentsSource collection of the drag source. SourceResources (available with Q2 2014 version of UI for Silverlight) - Gets a collection containing the original resources from which the dragging operation has started. TargetedAppointment (available with Q2 2014 version of UI for Silverlight) - Holds a reference to the targeted appointment on which the drop operation will be performed. CanResize(DragDropState state) - Gets the value specifying whether the resize operation can be finished or not. The method is called multiple times during the Resize operation and you can easily stop the operation by returning false. The following example demonstrates how to stop the resizing when the duration becomes more than two hours and less than half an hour. By default, the ConvertDraggedData method will be called constantly. This behavior can be modified through the CacheConvertedDragData property. DragDropCompleted( DragDropState state) - This method is called when the drag-drop operation is finished. DragDropCanceled( DragDropState state) - The method is called whenever the execution of the operation has failed for some reason. The default cursor is represented by setting the ResizeCursor property value to null. As of R1 2017 SP1, ScheduleViewDragDropBehavior exposes the CacheConvertedDragData property. Its default value is False, meaning that the ConvertDraggedData method will be called repeatedly. When the property is set to True, the method will be called only once and the converted data will be cached. Check out the online demo to see the RadScheduleView's Drag and Drop functionality in action.